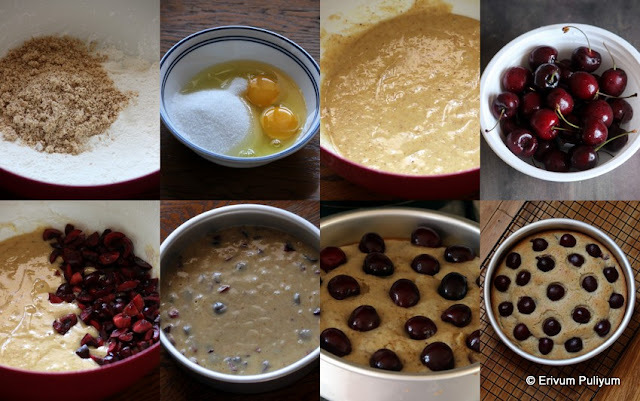 Erivum Puliyum: Cherry-Almond Cake (Step by Step Pics) ~ 800 th Post !! 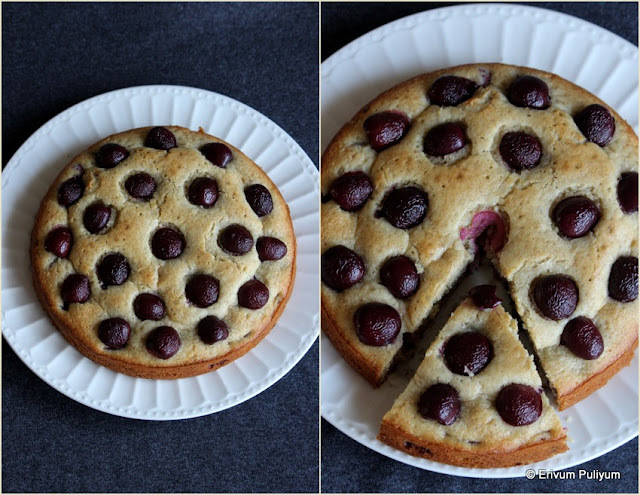 Cherry-Almond Cake (Step by Step Pics) ~ 800 th Post !! Time just flies and its been a couple of years since am in blogging. 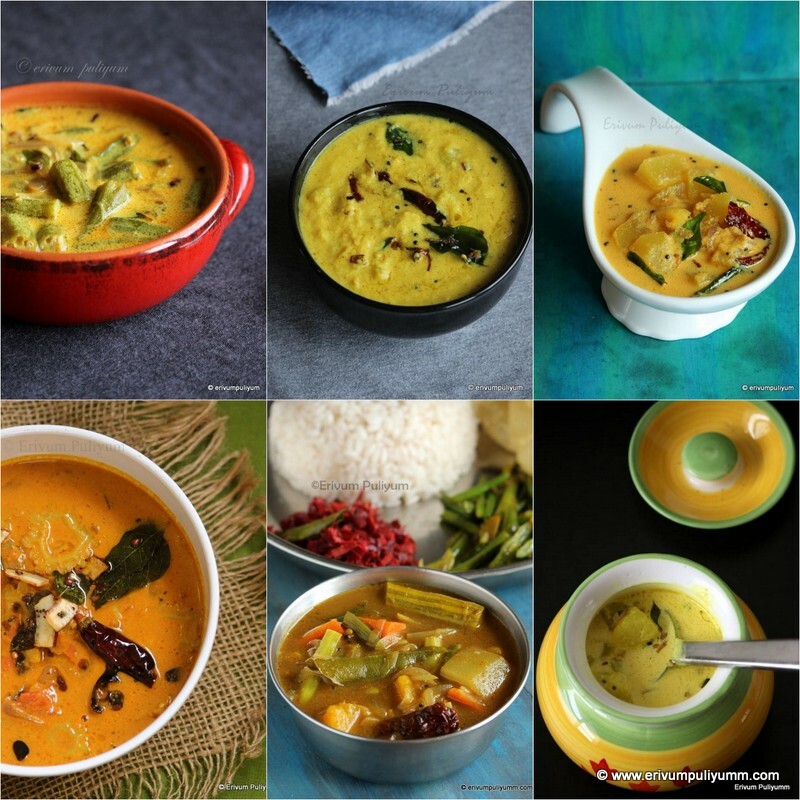 Though I had a long break recently but nothing stopped me from trying out new dishes whether am cooking or blogging. And believe me, this is my 800th post !! Huh.. can't believe myself the numbers as its quite a big number to me. 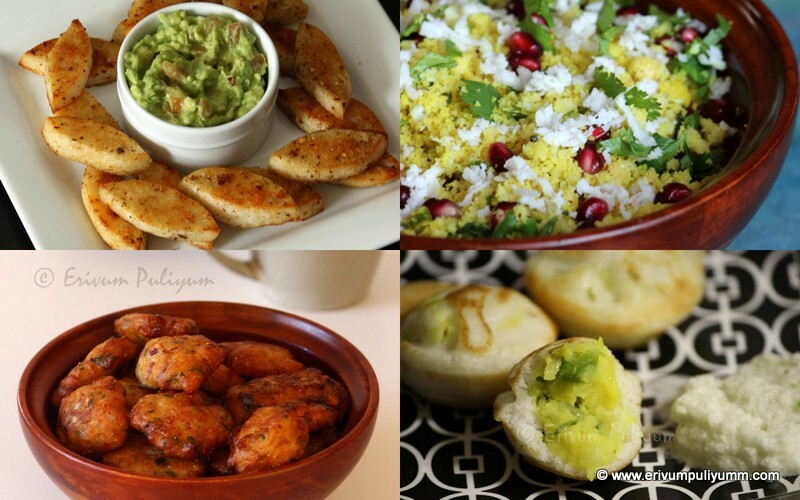 Never thought my passion of cooking would make me competent to showcase 800 tried and tested recipes in my space. Am happy with the love and feedback of my friends and readers that keeps me motivated always. Do keep them coming. Thanks a lot for all the love and consistent support, feeling happy to have you all around. Its been so long since I posted some bakes and here comes a yummy moist cake made with fresh cherries and has a unique almond flour. This has been saved to my drafts since long and was made during our stay in US(when you get the fresh cherries in season there). The problem when adding a heavy fruit to cake is,it invariably sinks to the bottom and so preserve a few to top the cake. The only tedious job in making this cake is the pitting of cherries,if you have a tool go ahead and do with it. Else use a skewer to push the seeds down the center and make sure to place a bowl underneath so that it doesn't stain the counter top. This cake reminds me of the polka dot pattern, Isn't it? Anyways do give this a try if you get fresh cherries where you live. Am sure all will love it!! Pre heat oven to 400 degrees F /190degrees C,spray the sides of a 8" or 9" spring form pan (preferably) but I used a 8"round pan.Line the bottom of the pan with parchment paper. Wash,rinse and dry the cherries.Pit them and cut 1/3 of the total cherries in halves(place them on a paper towel so that the cherry juices are absorbed and doesn't dribble in the cake. Keep aside.And to the remaining cherries,cut in quarters which will be mixed in the cake batter eventually. In another bowl,add flours,ground almonds,sugar and salt. Sieve twice to mix it well. In another bowl using a hand mixer,whisk the eggs and sugar well until its thick and light coloured. To this add, vanilla extract,melted butter and milk. Add the flour mixture little by little and using a rubber spatula, gently mix the batter. Finally fold in the cherries and pour the mix in the prepared cake pan. Place it in the oven and bake for 15 minutes. After 15 minutes,remove from oven and quickly arrange the halved cherries on top, return the pan to oven and bake for another 15-20 minutes or until golden brown or when the tooth pick comes out clean when pricked in the center of the cake(The total baking time for me was 35 minutes). Remove and cool on a wire rack for 15-20 minutes and serve with a dollop of whipped cream or just like that. I served just like that, tastes yumm ! * If you find the cake over browning then cover the top with a sheet of aluminium foil. * I have adapted the recipe from joy of baking and the only change I made is using wheat flour instead of all purpose flour.Though the cake came out moist and delicious but not as spongy as a all purpose flour cake. So if you really wish to have a spongy feel, use maida (all purpose flour). I used Ashirwaad atta or wheat flour. * The almond flour recipe is here in my space. 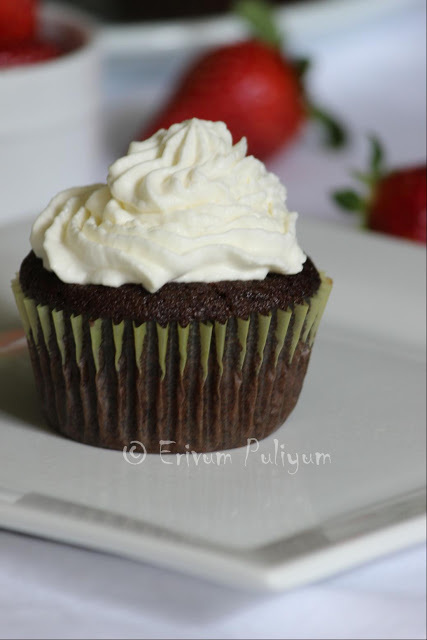 You may also be interested to try out other cakes listed in this page. Check out other fresh cherry recipes here in this link. What a beautiful cake! U want..
Congrats Julie for the Milestone... The cake looks delicious and perfectly made..
And congratulations on this achievement. I a sharing the boquet with you and super happy for you Juls.